This application uses an “algorithm” that works in conjunction with an interactive data visualisation interface to build enterprise understanding of a series of gold mining exploration sites. Each site had an estimated: available resource, capacity to mine the resource and a 15% reduction per year in the resource. These factors were included in the calculation which used the price of the material (gold) and the overarching “cost to mine” to visualise the viability of each exploration site. The interface tracks sites through each different phase of their lifespan, recording the data as they transition. This model combines the users ability to modify the price of gold and the cost of mining each year of the expected lifespan. 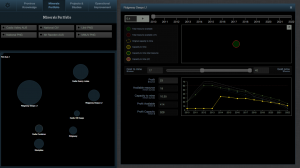 It also enables the visualisation of the vulnerability of specific projects as costs change. 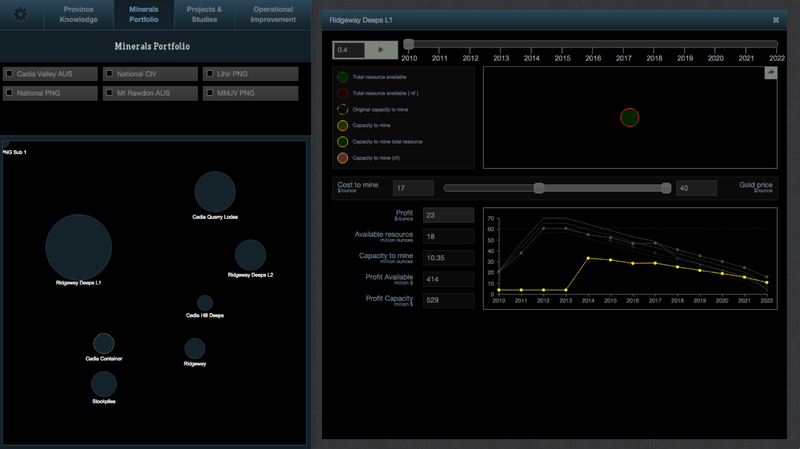 This aspect was visualised using an animation and real time sliders to show the sites “status” over the 15 years of its estimated operational lifespan. Full data management capabilities were also delivered as part of the project. Select a project from the project window above to display data and statistics in the centre window. The Google mapping component was also triggered with a click on the project.